Seattle Bootie Seattle: Electric Bootie Carnival! EDC artists mashed up! 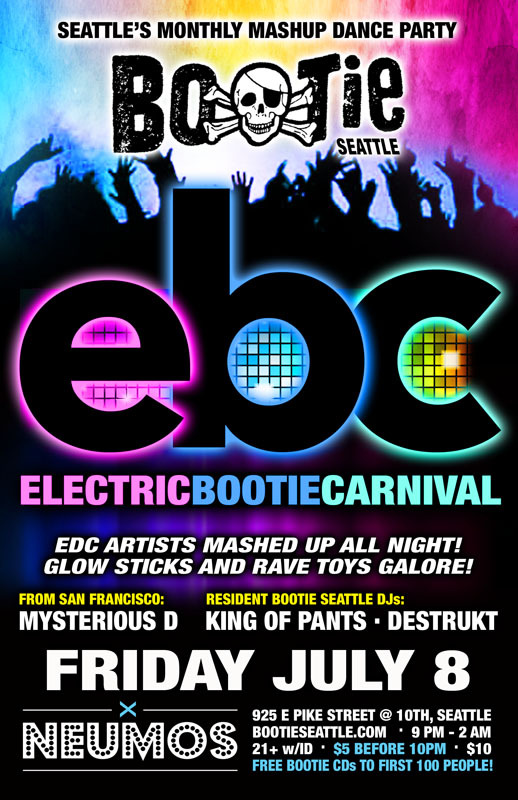 Bootie Seattle gives you the next best thing to being at EDC in Las Vegas last month — it’s the Electric Bootie Carnival! Expect EDM-flavored mashups all night long, LED sticks, glow necklaces, lasers, and rave toys galore to keep your candy-colored PLUR smiles going and getting you into the spirit of “EBC.” Only $5 before 10 PM! EDC artists mashed up all night! Glow sticks and rave toys galore! Bootie mashes up rave culture for the Electric Bootie Carnival, with Mysterious D coming up from Bootie SF to join Seattle resident DJs King of Pants and Destrukt, as they throw the best EDM-flavored mashups into the mix all night long, keeping the PLUR flowing and your bodies bouncing!